This page presents data and information associated with the CMB lensing reconstruction described in astro-ph/1202.0546 This is a reconstruction of lensing power spectra for 590 degrees of CMB sky observed by the SPT in 2008 and 2009. Lensing is detected at 6.3 sigma. The SPT lensing bandpowers (black) together with the ACT lensing bandpowers from Das et al. (2011). The solid line is not a fit to the data, but is the predicted CMB lensing potential power spectrum from a best-fit LCDM cosmology. 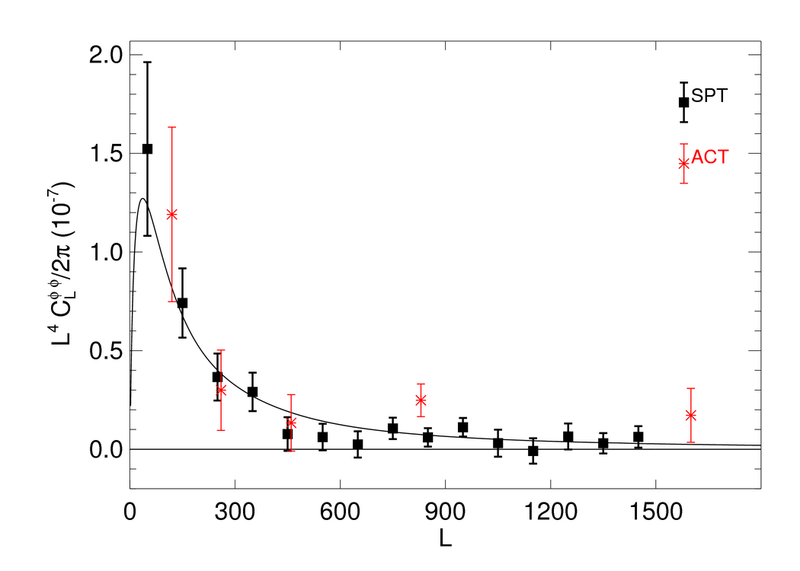 The bandpowers we obtain on the CMB lensing potential power spectrum are shown as black diamonds. Each grey line is the lensing power spectrum for a WMAP7-allowed model with nonzero spatial curvature. 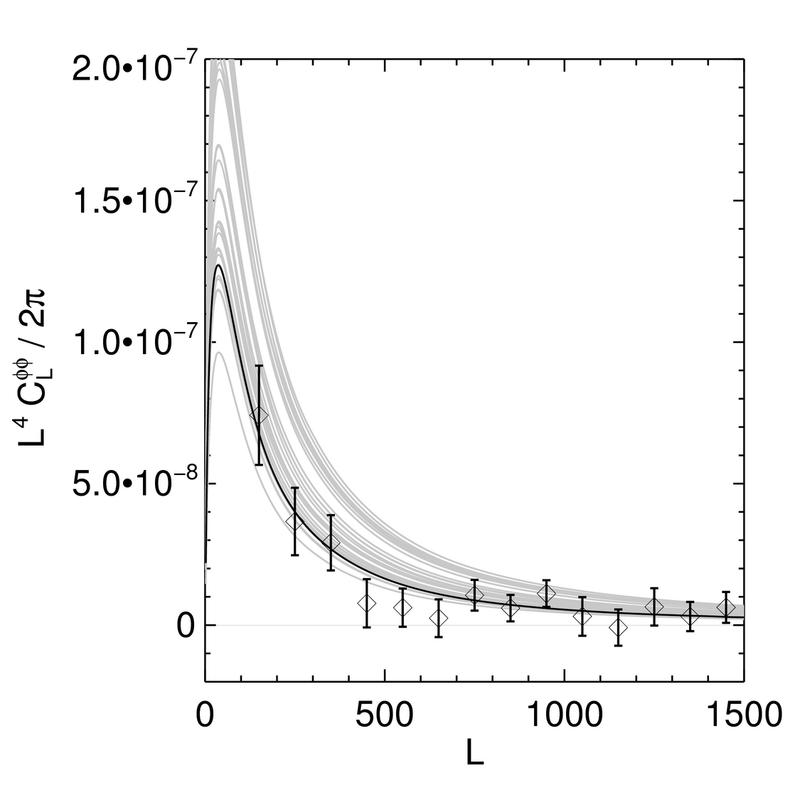 One-dimensional constraints on the lensing amplitude when marginalizing over LCDM parameters. 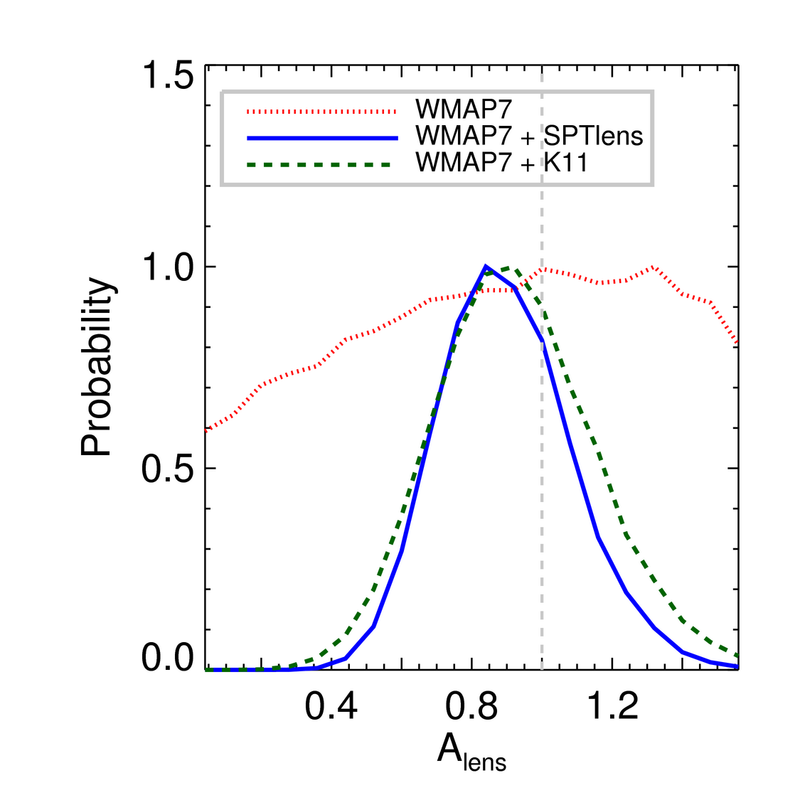 The WMAP power spectrum data (red dotted line) do not detect lensing. The SPT lensing data show a clear detection of lensing (solid blue curve), as do the SPT temperature power spectrum data from K11 (green dashed line). The SPT lensing bandpowers, shown in the figure above and in Table 2 of the paper, are available here . The error bars do not include the small uncertainty associated with subtracting the Gaussian noise bias. The bands are correlated at the 15% to 20% level. The covariance matrix is provided in this gzipped tar-file , and further instructions can be found in the enclosed readme. If you have any questions regarding this data set, please contact Alex van Engelen (engelen_at_physics_mcgill_ca).